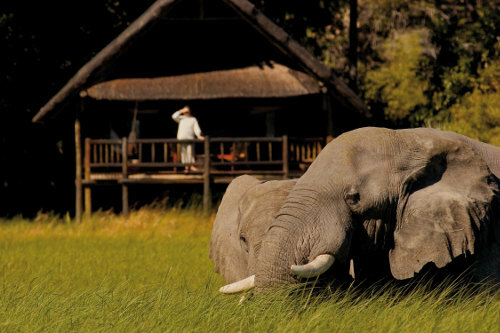 Khwai River Lodge nestles on the edge of a forest overlooking the vast floodplains of the Moremi Wildlife Reserve. Known for its exceptional range of big game, a host of animals are visible from the comfort of your own private deck at this luxury safari camp. All luxury tents at Khwai River Lodge are housed on raised wooden platforms, offering great views of the African landscape. The tents are shaded by a traditional African thatch roof. Wildlife is all around you at Khwai River Lodge as you relax on your large private deck furnished with easy chairs and a hammock. The deck also provides a spectacular environment for enjoying a private dinner in complete harmony with your surroundings, ideal for a special occasion or just as a treat. The tent interiors are luxuriously appointed with en suite bathrooms, a private fully stocked mini bar, four poster bed complete with mosquito netting as well as a discreet air conditioning.